You must register to bid first. It's fast and easy, click here. Hello Peter: I’m pretty sure that’s the house that my mother grew up in. It was owned by the Cartmell family of Midebury and my great-grandfather, Andrew Palsa, farmed it for him. I haven’t been by there in a long time, but that’s the way I remember it from the road. Its a beautiful scene Peter. I love your work! I could live in this beautiful painting. Not far from our one time home on Ridge Road, Cornwall. A look very much like today’s. 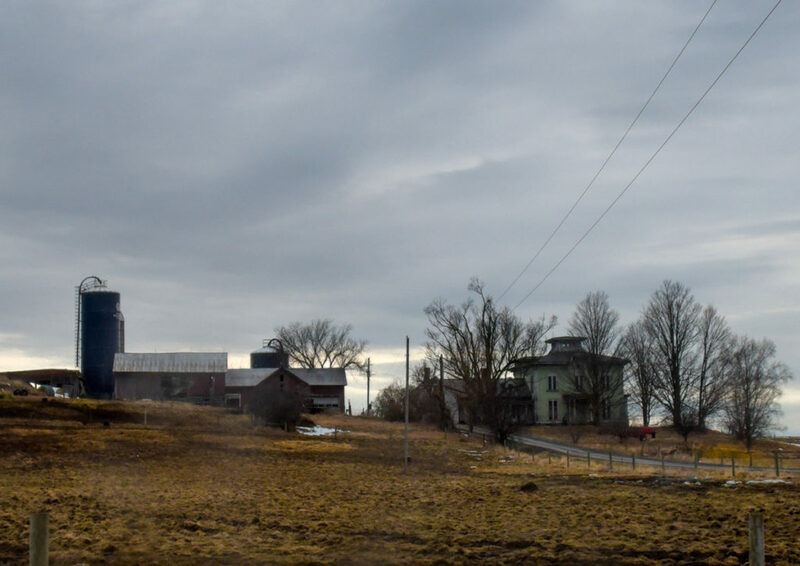 Another fantastic look at Vermont in all her seasons. Thank you!! Such a beautiful capture of the April weather done with true feeling. Those of us who are native Vermonters recognize this time of the year and love it also! You do such a wonderful job of bringing the beauty to us! Thank you once again Peter! Ah, yes, a very familiar sight. Beaurtiful. Is this available in a smaller print that I could afford to buy? Beneath dark and ominous skies, a rugged and beaten landscape lies. Old hay, shattered weeds, barren trees, echo tales of ancient barns and early homes. But, like standing in awe at the rising of sun on Easter morning, we know that April’s days will soon be replaced by those of May, and what was once only hoped for in confidence will come to dazzle us in its grace and glory. Just Beautiful! I can “feel” the spring day! INCREDIBLE AS ALWAYS PETER! Wish I had your talent. 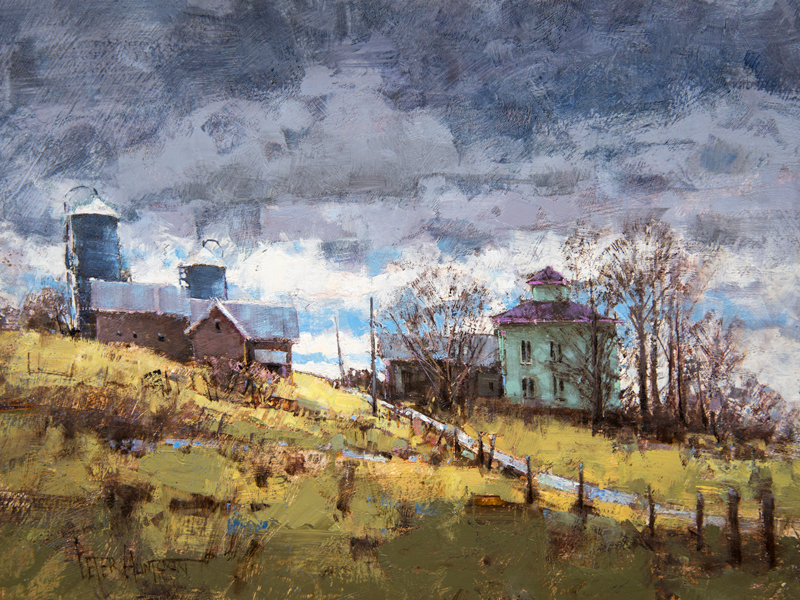 I love everything about this painting – the barn, the color of the house, the stormy sky – everything. Just beautiful! This time of year brings a quickening to my heart – Love this, Peter and patiently waiting for some buds – have the feeling that EVERYTHING will pop at the same time !! Lovely indeed….a special place I would love to visit again!! !…You captured the “stormy clouds” so true to nature this time of year…Fantastic work Peter!~!~!~! Thank you for sharing your Artistic talents!!!!! Brian, you’re a real poet in description of Peter’s paintings. i’ll write my impressions too. So we notice: the snow couldn’t resist the force of the sun and now the soil remains innocent in its old shabby clothes of rotten leaves and grass. But the earth begins to breathe and new clothes of fresh green will grow soon. “April, April macht, was er will”, we say in Germany. So it is. 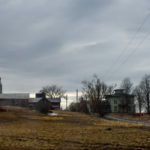 We regard a dramatic sky with its delicate blue grey clouds and soft violet colors of the barns and trees in contrast to the ocker and olive. The icy light blue of the house and the spots in the meadow are the peaks in the composition. So they attract our attention to the fine modulation of colors in this painting and the unify it. Not unlike a luxurious banquet, we savor the flavor of a fine painting with all of our senses, don’t we Doris!? So it is, Brian. So far away so near in emotions. And now I wish all of us happy, peaceful easter. Let’s hope the best for the “resurrection” of one of the most famous monuments in history the cathedral “Notre Dame de Paris” burned down monday evening. Perhaps this desaster shows the world what we lose if we don’t keep peace. It’s a sign for us in europe, a menetekel for being prudent and carefully. Peter, you never cease to amaze me. Thank you for sharing your wonderful talent. Peter……this sums up April pretty much so far…….but in such a lovely way. Thanks! My favorite part of spring is when that first delicate green appears. We only see that color for such a short time. Hoping you can capture that in a painting. Love your work! Thanks Sue, I’ll have an eye out for a good “new green” subject! One of my favorites, love your use of color, or maybe your lack of color. Not an artist so not sure how to describe what I see. Beautiful, serene in spite of the storm clouds. I truely enjoy your paintings, Peter Huntoon. Your descriptions are as interesting as the paintings. I am especially enjoying the comments for this painting. I am a fifth year student Watercolour artist trying to learn techniques to reach the goals of resembling your paintings. NOT so easy in watercolour.